Aside from the size of the bathroom, the homeowner’s style and budget determine the total cost of the job. In this blog post, we’re working on bathroom renovations with a budget that is less than or equal to $7000. 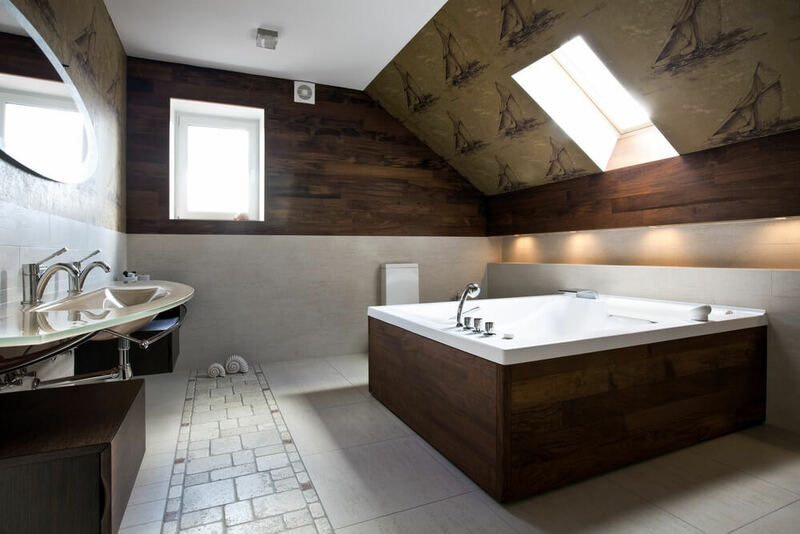 We’ll show you that you have a lot of options when it comes to remodelling your bathroom and not everything is as expensive as it seems. A recent visit to a home improvement store proved that today’s wallpapers can give the wow factor you might be looking for. Choose a wallpaper with intricate, repetitive designs if you want to hide your wall’s imperfections. Use metallic wallpapers if you want to reflect light back in the room. The lustre will make the room brighter and larger. Designer Tip: Make sure that your walls are smooth before applying the wallpaper. Remove all the paint that scrapes from the wall and fill in all the holes and cracks. Painting is undeniably the most popular way of updating someone’s bathroom. A fresh coat of paint on the walls and ceiling can dramatically change the room. You can also paint your good old tiles and wood panelling. This trick is cheaper than replacing them. Step 1: Clean the old tiled or wood panelling floor with a tough cleanser and let it dry. Step 2: Sand it until you removed the glaze on top of the material. Wipe the dust off. Step 3: Apply a coat of primer. You’ll see that the roughened surface absorbs the paint better. Let it dry Step 4: Cover it with two coats of your chosen paint colour. Designer Tip: Use glossy, satin, or epoxy paint on your floors. The glossy surface makes the bathroom floors easier to clean in the future. Matte and acrylic finishes scratch easily and will look lacklustre in time. If you really want to revamp your bathroom, switch to tiles. It is a game changer in the bathroom because you can use it as your wall and backsplash. Use one tile colour if you want to create a seamless and sophisticated bathroom. Feel free to style your walls using mosaic tiles or other unique tile shapes. If your bathroom is a bit larger, lay large tiles. It will give justice to the size of your bathroom. Plus, it’s easier to install! Designer Tip: Don’t underestimate a tiling job. We’ve seen people who tried to DIY it and did a terrible job. If you’re not confident of your skills, call a professional tiler. These people normally charge per area, but they can charge per hour if the tiling job involves installation of intricate tile designs and patterns. Porcelain tiles are great for bathrooms. It’s non-porous and it can be glazed or unglazed. The finish of tiles you install depends on your priority as the homeowner. Choose non-slip tiles if you want to make your bathroom safer. On the other hand, lay glossy tiles if you want something that is easier to clean. Some people are lucky to find good, old-fashioned floorboards under an outdated vinyl, tile, or laminate. Go for it, as long as the floorboards you see are in good condition. It will give your bathroom a warm, rustic feel that you will enjoy. Designer Tip: Sand the board thoroughly until you remove all the dirt on its surface. Hammer nail flushes to even out the floor. Clean the floor before staining it with clear or tinted varnish. Concrete flooring is great for you if you want a trendy and sturdy bathroom for a low-cost. You can use the concrete slab under your old flooring material. Simply grind it to smoothen its surface and seal it with polyurethane. Reseal it every few years. You can also try to polish it. 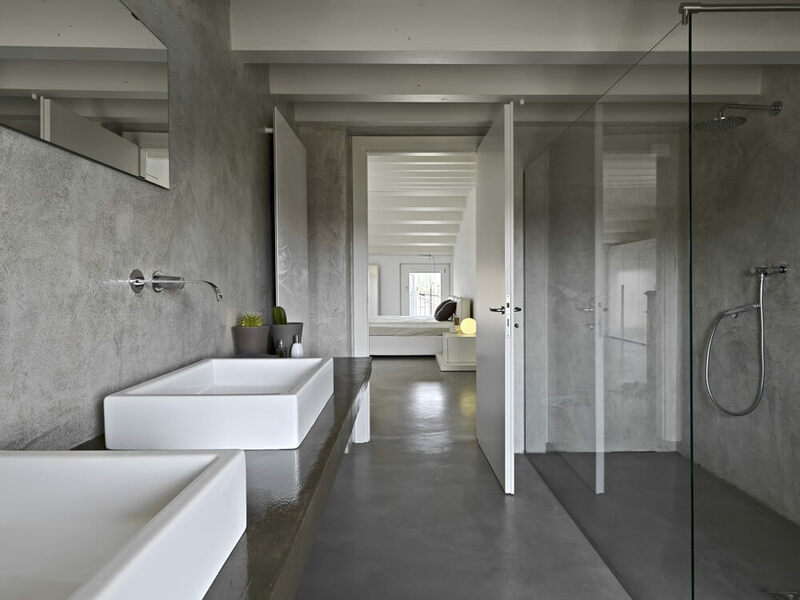 Polished concrete works best if you just poured a new concrete flooring in your bathroom. This is not an easy job, therefore you need the help of an experienced builder. Try to get two to three quotes from different design professionals near you. Designer Tip: A large factor that affects the price of your bathroom flooring will be the size of your space. Concrete floors are an economical choice whether you have small to medium or master-sized bathroom. Change your bathtub when you notice that it chipped, cracked, or have moulds that you can’t repair. Choose something that can be an elegant centrepiece such as a freestanding bath. Designer Tip: The tub is one of the ticket items in the bathroom. It’s not cheap. If you’re planning to change your tub, tell your designer. Prioritise it in your budget. You have no choice but to splurge on a new tub but you can save a lot in your vanity. Instead of doing custom vanity storage, we want you to repurpose an old furniture. It can be your old console or dresser that’s sitting in the attic or basement. Use your current basin for this project. Hire a carpenter to cut a hole for the basin in the furniture. Let your plumber do the rest. Designer Tip: This is a charming addition to a modern bathroom. Feel free to retain the rustic feel of the furniture. The texture will stand out from the rest. You can also restore the furniture until it looks like a custom-made piece for your bath. It is nice to separate the shower area from the rest of the bathroom. You can still do this even if you have a small bathroom. Squeeze in a frameless glass in between the shower area and the vanity. This screens the walk-in shower and keeps the water splashes from wetting the entire bathroom. Install the shower rose, tap, and rail after you’ve installed the frameless glass. Designer Tip: This is another ticket item in your bathroom. Always go for construction grade glass. Use the clear glass if you want to make your bathroom bigger. On the other hand, use a frosted glass if you want to have a little privacy in the shower. 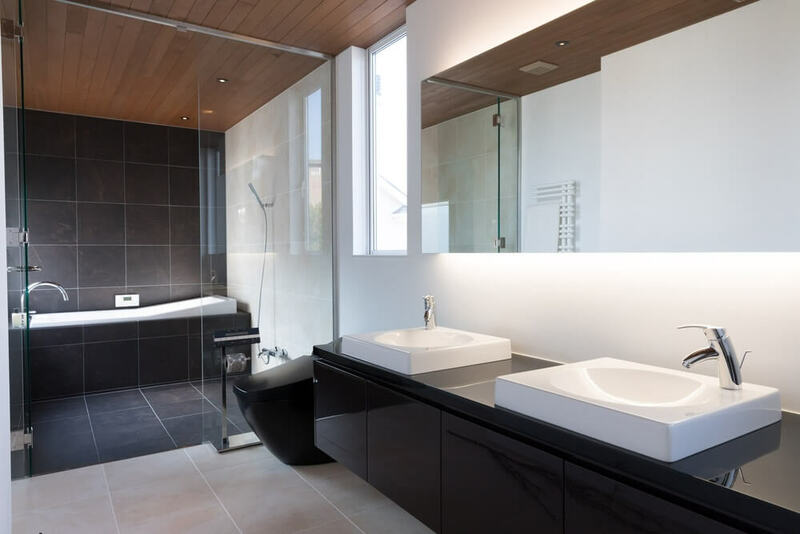 Lining your bathroom mirror with LED strip light accentuates your vanity. This is a great design choice especially if you don’t have a focal point in the bathroom yet. Putting lights behind the mirror also erases the shadows cast by the upper light bulbs on your face. That means you can do your makeup or examine yourself better in the bathroom. Designer Tip: LED lights are one of the most affordable and sustainable light choices in the market. If you don’t fancy pendant lights in the bathroom, install LED recessed lights in the ceiling. Hanging a stunning pendant light in your bathroom is a quick and easy way to add interest and focal point in the space. The temperature of the light will update the look of your bathroom. Yellowish lights will give the bathroom a softer, warmer feel compared to white, bluish lights. Designer Tip: There are a lot of options available in the market today. If you want your pendant light to stand out, choose an item that hooks attention. It can be a small chandelier, a metal industrial light, or a wicker pendant. When your pendant light screams pizazz already, you don’t need to establish another focal point in the bathroom. These are the most budget-friendly bathroom renovations that you can do to your space. It is best to remodel a bathroom when you just moved in or when you are preparing to sell the house. These changes won’t boost the price of your home so much in the market but you might get a higher resale value. 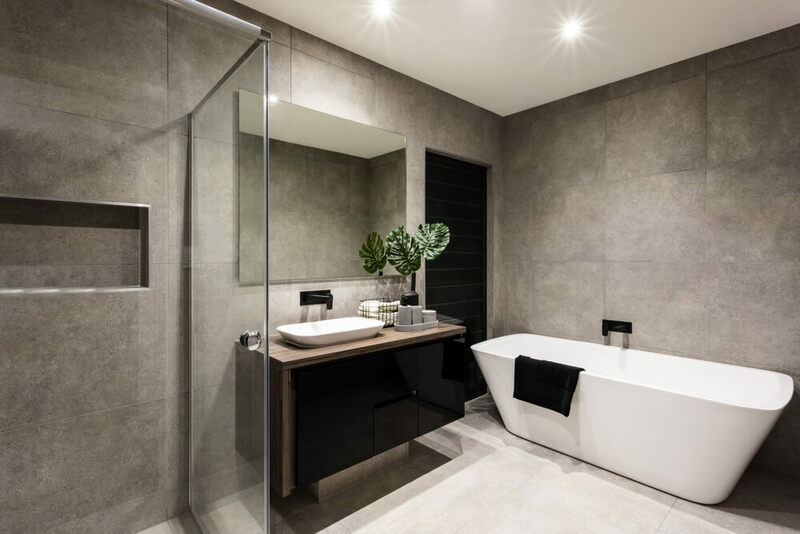 Get the best bathroom design in your architectural house plan when you engage one of our Brisbane architects.